If you're anything like me, coming up with things to make for dinner night after night gets old and can be such a daunting task! I get tired of making and eating the same few staple dishes every week. It almost makes you disenchanted with food altogether! Ok, maybe that's a little dramatic…you know I don't skip any meals! So on those nights where I don't feel like cooking a whole meal and just want something easy, we usually do wine, cheese and charcuterie. HOWEVER, I decided to switch things up a bit a do a fun night of crostini's! It's actually a really fun date night idea…I highly recommend it. I sprinkled some sea salt to add a little extra flavor! 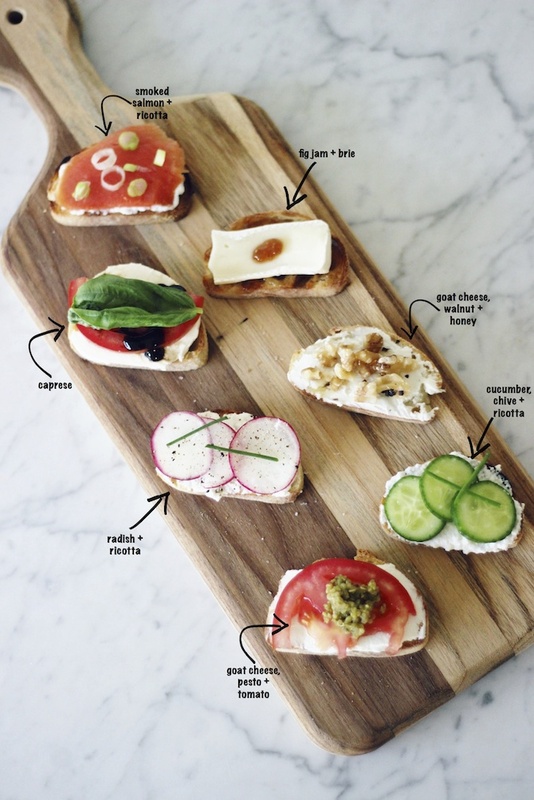 The fun part about making crostini's is that you can really try so many different combinations and have fun with it. Just start with a delicious baguette, slice it and then toast the bread in the oven until it gets toasted and crispy.